On the other hand, a more recent, also very popular song book, Sangbogen 1 – 2 (1988 and 1996) with a spiral binding, published by Edition Wilhelm Hansen, contains all three of the melodies mentioned below, so it would appear that all three still have a public. The poem “Danmark” (“Denmark”) was published in the newspaper Fædrelandet (The Fatherland) on 5th March 1850. Its very patriotic tone was prompted by the war against Prussia in 1848–50, but now with a special focus on the Danish landscape, language and history rather than wartime events and heroic deeds. The poem was therefore followed up by the many patriotic verses that appeared during these years. Andersen was no exception. His Collected Works include a section called “Fædrelandske Digte under Krigen” (“Patriotic Poems during the War”), which contains no less than 13 works, including “In Denmark I was born”, and a revised version of “Danmark, dejligst Vang og Vænge” (Denmark’s lovely Fields and Meadows”). A number of these poems were no doubt inspired by his visit to Glorup Manor [see illustration here] in May/June 1848, where a number of soldiers were billeted. In May 1850 Andersen sent his poem to his German publisher Carl Lorck to be translated and published in Lorck’s paper Nordischer Telegraph, but the paper folded before it was able to publish Andersen’s very Danish song. Andersen stayed at Glorup Manor quite frequently during the spring of 1848 and experienced the mood of the Danish soldiers billeted there. In connection with the celebrations prompted by the return of the soldiers on 7th July 1851, Andersen made this sketch for the decoration of the festival tent (Odense Bys Museer). One of Andersen’s attentive readers, the physicist H.C. Ørsted, complained, however, that the text only praised nature and history but made no mention of science. “One day he said, jokingly, ‘you have offended against science, forgotten what you owe to it – not with one word have you mentioned it in your beautiful poem ‘Danmark, mit Fædreland’ (‘Denmark, my fatherland’) so I have attempted to remedy the matter!’ and he brought me a verse he had written and added to my poem between the third and fourth verse...” Andersen wrote this in Mit Livs Eventyr (The Story of my Life) in which he also quotes Ørsted’s verse. The poem inspired the composer Henrik Rung to make an arrangement for a male choir, which was first performed at a charity concert in the Casino Theatre in Copenhagen on 8th May 1850. The concert was arranged by the Scandinavian Club, whose choral society was conducted by Rung. The aim was to collect money for a monument to commemorate the Danish victory at the Battle of Fredericia on 6th July 1849, so the entire second half of the concert was devoted to Rung’s music for Carl Ploug’s long poem “The Battle of Fredericia”. The collection also contributed to H.V. Bissen’s statue “The Infantryman”, which was unveiled in 1858 and is still Fredericia’s landmark. Andersen himself wrote in a letter to Lorck that “...a song of mine, which has appealed to many people, with beautiful music by Rung, was recently performed by the Scandinavian Society.” Rung also performed it later in the month at a similar concert in the Casino Theatre, and it was sung by the choral society at several of the celebrations for the soldiers who had come home from the war. Rung’s melody became very popular and was published in a number of the song-books of the period. Already that same year the poem was included (marked ‘melody by Rung’) in the popular song book Nye og gamle Viser af og for det Danske Folk (2nd ed. 1850) (New and Old Songs by and for the Danish People). In 1852 the song was published as an independent music sheet in an edition for one voice accompanied by both piano and guitar. The guitar was one of the fashionable instruments of the day and Rung was particularly fascinated by it. Henrik Rung’s melody long remained the only widely distributed melody for this poem by Andersen. Even though it began with a movement for a male choir it enjoyed considerable popularity in this way as a community song, but it can also be difficult to sing because of the vocal range required and the rather protracted ending. However, there are many reports of Andersen having heard it, either sung by a choir or as a community song. The text also appealed to the composer Poul Schierbeck, who in 1926 wrote the melody which can now be found, for example, in the Folk High School Song Book. Carl Nielsen, amongst others, was very impressed by it. The song was published in a collection of seven songs, I Danmark (In Denmark), op. 21 of 1926, in which it forms the introduction. The following year all the songs were initally performed by the composer’s wife, Sylvia Schierbeck, with himself at the piano. On Schierbeck’s 50th birthday in 1938 he wrote Præludium eller Parafrase for Strygere op. 43 (Prelude or Paraphrase for Strings) on this, his best known melody, and it was performed for the first time that same year by Erik Tuxen and the Radio Symphony Orchestra. The composer Bo Holten (b. 1948) has also written three variations on Schierbeck’s melody for a brass instrumentalist ensemble. Finally, the composer and musician Sebastian used the text in the musical Hans Christian Andersen at Gladsaxe Theatre in 1996. His melody is also very lyrical and has very clear associations with Schierbeck’s, especially the introductory and final bars. “In Denmark I was born” was first performed at a very national concert aimed at providing a monument to celebrate the Danish victory at the Battle of Fredericia on 6th July 1849. The monument was H.V. 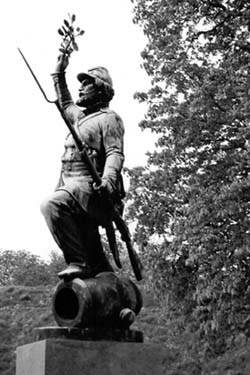 Bissen’s statue “The Infantryman” and was unveiled in 1858. The newspaper Fædrelandet (The Fatherland) supported the national–liberal movement in Denmark and was engaged in the idea of a free constitution as well as a Scandinavian union. 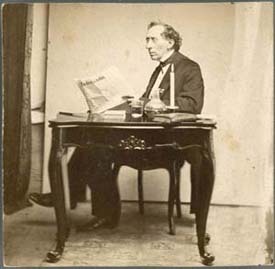 Several of Andersen’s poems were printed in Fædrelandet, and this photograph (from 1868) shows him reading the newspaper.